You have to update passport details in Jawazat or update passport information in Absher account to make it valid. In this article, we have explained the procedure to do Naqal Maloomat online or update dependent passport details in Absher. 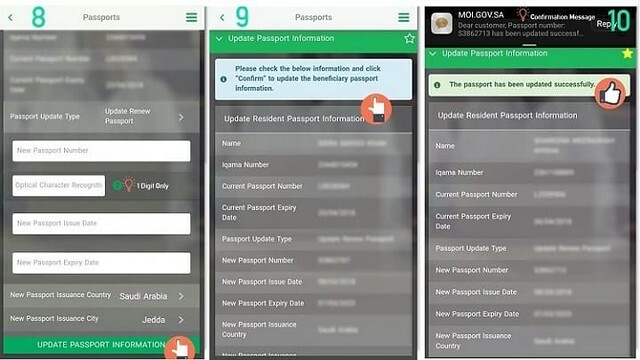 It is important to mention here that you would not be able to travel out of Saudi Arabia if your passport is not updated in the MOI system. Technically speaking, naqal maloomat means to update passport information in Absher or the systems of Jawazat (MOI). Who can do the naqal maloomat online? It is important to mention here that your sponsor (Kafeel) is the only person who can update passport details in Jawazat. If you are an employee, your Kafeel is responsible for this. Similarly, you can update dependent passport details in Absher account using the procedure Online Naqal Maloomat procedure given below. Earlier people had to visit the Jawazat office to do Naqal Maloomat. However, now you just need to install and login to Abshir Mobile Application. Currently, the online Naqal Maloomat is not available on the desktop website. In other words, you don't need to fill the naqal maloomat form manually. How to do Naqal Maloomat online? In order to do Naqal Maloomat online, you need to login to the Mobile Application using your Abshir or MOI account, click on “E-Services” and then “Passports”. Another drop-down list will appear from which you will have to select “Update Resident Passport Information”. On the next screen appearing on your mobile phone, you will be required to click on the button “Start Using Service”. In the next screen, click on the “dependent list” as shown in the screenshot below. After that choose the dependent for whom you want to update passport information in Absher. Click on the dependent and the application will open further details related to this. Just click on the “Next” button to proceed further. Now, this is the final step to do Naqal Maloomat online so you need to enter it carefully. You are required to enter the new passport number containing alphabets and digits, the issuance date of the new passport as well as the expiry date of the new passport. You will also have to enter “New Passport Issuance Country” as well as “New Passport Issuance City“. Make sure you enter the information provided on your passport. What is the New Passport Issuance City in Naqal Maloomat? As the city name is normally not mentioned on the passport, you can write the name of the capital of the country which has issued your passport e.g. Islamabad. The passport issuance country is not Saudi Arabia, in fact, it is your home country. You can also cross-check this information as passport issuing authority is written on most of the passports. What if Naqal Maloomat online system does not work? In some cases, you would not be allowed to update dependent passport details in Absher due to some error. The system would require you to visit the Jawazat office to update dependent passport details in Absher. Most of the times, it is due to the fact that the fingerprints of your dependents are not registered with the MOI system. Now the Jawazat requires every dependent who is 6 years or above to register his/her fingerprints with Jawazat. There is a penalty of SAR 1,000 to update passport information in Absher or update passport details in jawazat if the old passport is lost. What to do if the Passport is renewed in Native Country? How to check that Naqal Maloomat has been done properly? After completing all this process, you should check at least once before traveling, that Naqal Maloomat has been done properly. There are cases when despite going through the process to update passport information in Absher, Naqal Maloomat was still not updated in the system. As a result of which, passengers had to face real problems. Please read this article to check if the Naqal Maloomat has been done properly. Recommended: How to check if Naqal Maloomat has been done properly?